Mckai Henry receives Service Above Self Award for November. Mckai Henry became the first sixth grader from Benzie Central Schools to receive the Service Above Self Award. 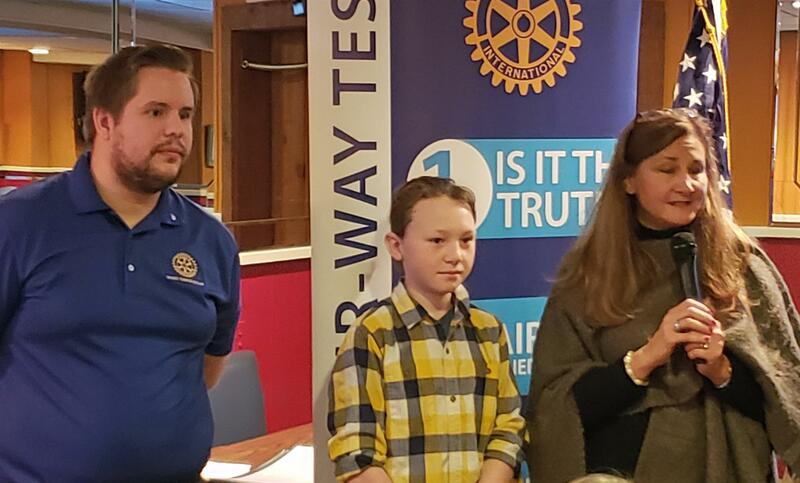 Mckai was introduced by Kim O'Connor, sixth grade social studies teacher, who stressed that Mckai always looks out for others before himself. He is active with the PRIDE team at school and is an avid origami artist. In fact, he made an origami horse while waiting to be introduced after breakfast. He is the kind of young man who if he sees a piece of scrap paper on the ground will pick it up. McKai has a range of career possibilities in mind as might be expected at his age: musician, mechanical engineer, an architect or a preservationist. With his determination and concern for others he will likely achieve whichever he sets his mind to.